Do you have a backup plan in case your brilliant plan as a coach doesn’t work? It’s something to think about, because it happens to all of us. As coaches we draw up all these plays where every player executes his assignment perfectly, the opponent still hasn’t caught on to what we’re trying to do, and everyone on your team has the same amount of awareness you do when putting this plan together. Except that’s not how it works, and you know it. You need plays to go to when your first choice isn’t getting it done. For example, if you’re a team that runs a lot of speed option, you’d need to have something else in your playbook that can take advantage of the defense focusing way too much on that play. Speaking of which, in today’s post we’re gonna look at Gus Malzahn’s version of the quarterback counter play. 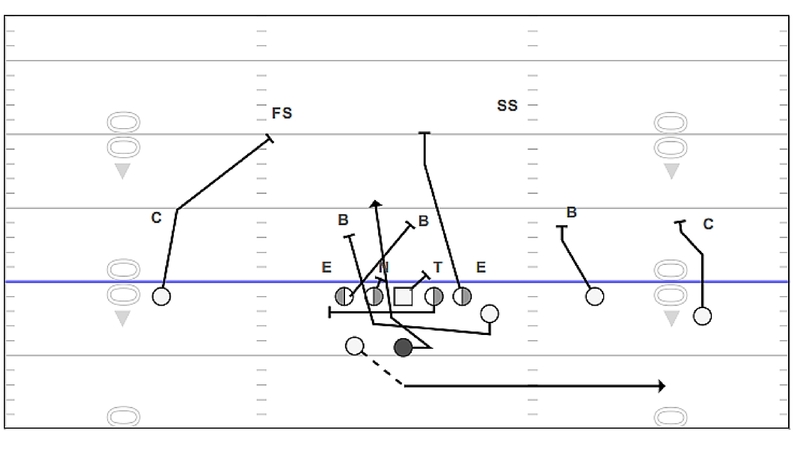 This play works because of the huge amount of option runs in this offense. Malzahn loves athletic quarterbacks who can push defenses to the limit with their ability to stretch the field horizontally as well as vertically. Having this kind of athlete taking the snaps in your offense creates all kinds of opportunities, and if a defense is starting to focus too much on your option run game, this is a great way to keep them honest. The great thing about this scheme is that for almost everyone, especially the big guys up front, they’re just blocking the regular “counter” scheme as if the tail back was getting the football and following his blocks. It’s this kind of flexibility within the scheme that makes the Gus Malzahn offense so much easier to teach and execute. Once the tailback motion removes a defender from the box, it’s a much better numbers game at that point for the offense. All of a sudden they’ve got five blockers for four defenders. The right tackle doesn’t count in this case, since he’s not blocking anyone in the box. The quarterback should take the snap, use a quick jab step to the right side to act as if he’s starting on an option path, then pivot and split the two pullers in front of him. This play starts working before the ball is even snapped with the tailback flipping sides in motion and starting on his normal option pitch path, as if he was going to be the pitch man on a normal speed option. This is great for two reasons: The tailback motion works great against man coverage teams, removing a linebacker from the box, and it’s effective against aggressive safeties who may try to get a jump on the option play he thinks is coming. The tailback should raise his hands after motioning from the backfield so that he looks like he’s receiving the option pitch, just to keep the deception going a little bit longer. When it comes to the alignment of the QB in the backfield, he should have his front foot at 4 yards, back foot at 4 and a half to be in perfect position to take the snap and time up with the blockers in front of him as they pull across to the weak side of the formation. If you’ve got a weak center you can cheat up the QB an extra half yard, but that’s as close as you can get and still have room for the backfield action of everyone else. As we discussed above, the right tackle (backside tackle in this scheme) is heading to the second level in order to cut off any pursuit from the secondary, especially if the safety to that side bites too hard on the tailback motion, thus sealing himself off from the rest of the play (Of course, you can easily adjust this if you’re facing a particularly challenging player at the defensive end spot). This play is a perfect example of how a well-crafted offense with solid and athletic players has the ability to adjust to just about anything a defense can throw at it. If the defense is getting a little too aggressive and starts to sniff out the speed option play, this is a great way to catch them off guard just when they think they know exactly what’s coming next. Click the link to learn more about the Gus Malzahn offense.